CRM_InnoNet will drive networking, policy and innovation in the field of substitution of critical raw materials. Securing availability and access to critical raw materials constitutes a strategic objective for the EU political and economic agenda. Key EU industrial sectors such as construction, chemicals, automotive, aerospace and machinery provide a total added value of €1,324 billion and 30 million jobs and depend on access to critical raw materials. Rare earth elements are essential to industrial production, particularly for clean energy options such as wind turbines, solar cells, electric vehicles and energy-efficient lighting. The scarcity of critical raw materials, together with their economic importance, makes it necessary to explore new avenues towards substitution in order to reduce the EU’s consumption and decrease the relative dependence upon imports. Recognising the potential problems that resource scarcity poses EU industry, the European Commission funded CRM_InnoNet to drive progress in the field of substitution of critical raw materials. Substitution is one important strategy for reducing demand for raw materials, but CRM_InnoNet will always consider substitution in the context of other approaches, such as recycling and increased extraction. Click on our project ‘prezi’ below to explore the project in more detail. 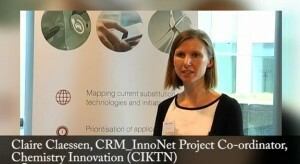 Click on our video below to hear Claire Claessen from Chemistry Innovation, CRM_InnoNet project co-ordinator, describe the overall objectives of the project and how to get involved. Pablo Tello, from PNO Consultants, talks about how they are leading on creation of an Innovation Network, one of the key goals of CRM_InnoNet. Generation of ideas for possible novel funding actions. Prioritision of R&D needs in order to support the EU strategic approach. Improving coordination of R&I actions in the field of raw materials substitution. Increasing efficiency and effectiveness of EU research activities in this field. Creation of one (or more) Innovation Network to provide networking opportunities around the topic of substitution. Together these actions will enable CRM_InnoNet to contribute to the successful implementation of the EU Raw Materials Initiative. To find out more about how CRM_InnoNet will deliver this impact, please visit the project objectives page. CRM_InnoNet is supported under the NMP (nanosciences, nanotechnologies, materials and new production technologies) theme of the European Commission 7th Framework Programme (project number 319024).